It was the eighth time I have done this, bringing a cat in a cage to the vet’s office, knowing that the cage would be empty on the return trip. Harry had been with us for more than 12 years, ever since he was spotted around our house, looking eerily like another stray we had adopted a year earlier. Unlike the other, however, Harry was aloof, not letting us near him. I knew he was a male; I saw him mark the territory one night. He was right about marking it, more right than either he or I expected. We left food out, and it disappeared. But he never came near us. He wanted nothing to do with humans. I was in the office, with my wife, both of us with red faces and barely trying to stop sobbing. Lisa, the vet tech, knew us, and we sat down, as a woman paid her bill. We put a trap out and kept it open, gradually starting moving food closer and closer to the trap. Harry, who of course, wasn’t yet named, ate the food but avoided the trap. Finally, after 2 months, we put the food in the trap but left it open. Harry could come and go into the trap, and he did. Finally, we set the trap; my wife slept inside, on the other side of the door, a classic “bait and switch” maneuver. BAM, CRASH; 1 a.m. the trap, plus one very upset large black cat, was on the ground. My wife picked up the spitting and growling “prize,” putting it in the trunk of the car. A little boy came up to the cage, and said, “Is that a kitty?” Fortunately his mother said, “Honey, it is not a good idea to be around other animals here. They aren’t feeling well.” I silently thanked her. Harry was hauled to the vet, who gave him ketamine through the bars of the trap, since there was no other way to anesthetize him. Jupiter would completely orbit the Sun before Harry would receive it again. After neutering, I brought him home, putting him in the back room, where he tried to jump out a closed window, hitting glass. We figured we wouldn’t keep him, but we waited to see what happened. We were then taken in a room and sat down. I had to tilt the cage to get Harry out, because he was at the far end of it. In three days, I had Harry purring. In a week, he was out in the house. At night, he was kept in the room, door open, a gate with polyethylene bars blocking exit–we thought. One night, he appeared in the hallway outside the room, as if the bars didn’t exist. Two of bars apparently were loose, like station 9 3/4, where he could go right through a door, like Harry Potter, whom J.K. Rowling had recently introduced to the world. All our cats–we’ve had 18–named themselves. He would be Harry P., then just Harry. He remained aloof and his coat was coarse, but never again was he interested in the outdoors. I lifted Harry into my arms, stroking his thin frame, every bone easily palpable, his coat so thin that skin was showing. He buried his head in my elbow. 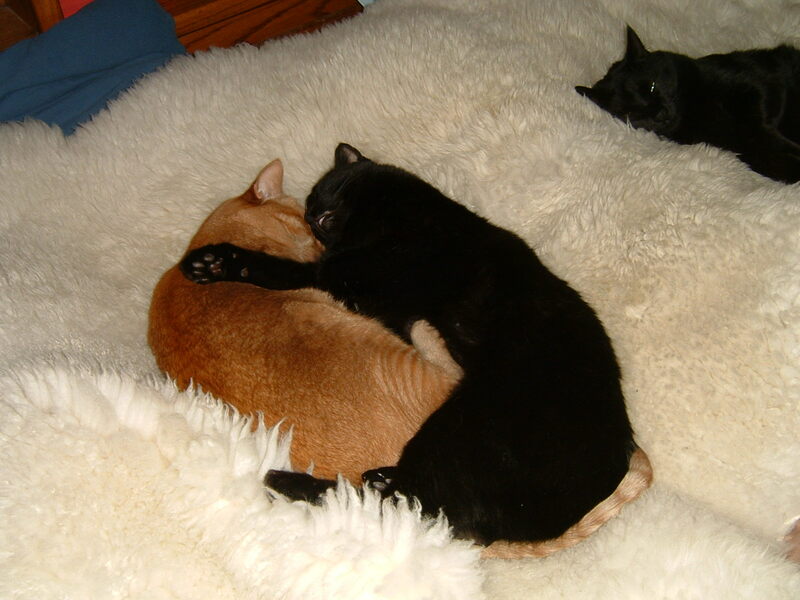 We had three black strays and wondered if they were related. Jack arrived on a hot summer day in 1991, appearing on the front porch with one eye swollen and blind. 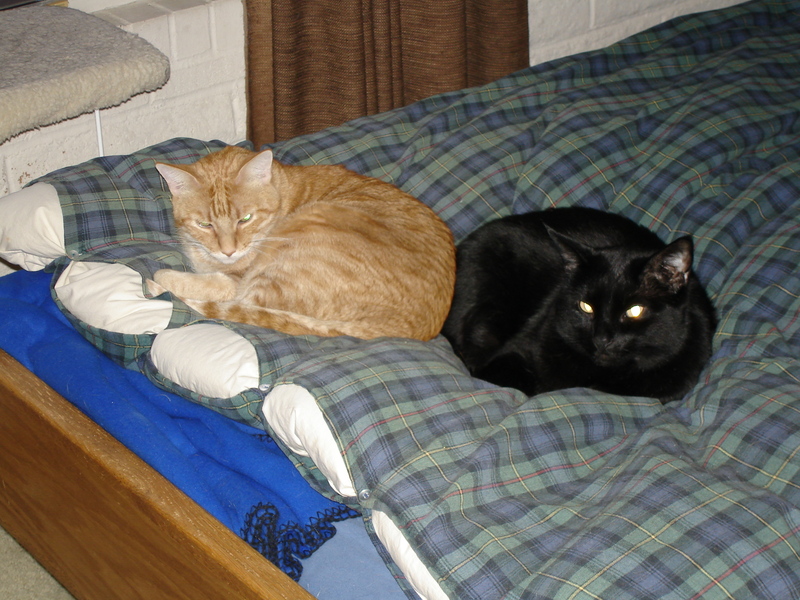 Nine years later, B.C., (Black Cat) appeared and accepted house life as well. We didn’t think Jack would survive. He lived 15 years. We hoped B.C. would live 15 years; in 2006, he suddenly dropped dead in the hallway one night. As we signed the permission slip, we asked about the sedative, which we hadn’t used before. “We have started doing that, lately. Renal failure veins are often small to get into.” Sedation sounded fine, as I continued to stroke Harry, now calmer. Over time, Harry became fat, 24 pounds, losing weight after one of his buddies died, when less food was available. His coat became more silky, he stopped biting us, still remaining a little aloof. “I’ll inject the sedative.” Harry moved a little, but he quickly settled down. As time passed, Harry became more sociable, but last year, we noted that he was thinner, 5 1/2 pounds lost in a year. We thought it was age, but the vet found an abscessed tooth, needing difficult surgery. How that must have hurt, but cats hide pain. We learned then his creatinine was 7, a sign of serious renal failure. Harry was fully relaxed in my arms now. What a good boy you have been, Harry P. Thank you for gracing our lives. For nine months, we gave Harry fluids under the skin twice a day, with a phosphate binder injected into his mouth. My wife did most of the work; I figured out how to get the binder into a syringe. We didn’t think Harry would survive a week, but he made it through summer. He became more sociable,too; indeed, he was a different cat, losing weight, but nicer. “I think we’re ready now,” said the vet. “He’s almost asleep.” Thank you, Harry, for everything you gave us. I’m so sorry I wasn’t nicer when you didn’t eat, because I didn’t know how to handle grief. Boys are taught not to cry, when they should, but they have to direct their emotion elsewhere, and I directed mine towards anger. I’m learning, Harry. Thank you for teaching me. The vet put a rubber band around the right front leg, cutting a little of the beautiful black hair Harry had over the now visible vein. How many times we thought Harry wouldn’t survive a week, when the next day he ate a can of food! He started chasing one of the other cats, which we loved to see. His weight, however, relentlessly fell, below 12 pounds, then 11, then to 10. It took 5 or 6 different cans of food some days for him to eat anything. It was more difficult. “I think we are ready.” The lavender solution was pretty. I couldn’t look at Harry’s eyes. I have seen life leave eyes before. It’s incredibly sad, but it taught me compassion. Finally, nine months after Harry’s illness, one morning he ate nothing and went away. My wife appeared, and I said, quietly, “Today or tomorrow.” She hugged me, both of us in tears, and said, “Today.” We had trouble finding him. We blocked hiding places, but he still found a good one. When cats start to hide, they are saying they are looking for a place to die. We listened. Harry with his buddy, Ace. He liked Gryffindor, too. This has been on my Phone for years. This entry was posted on February 14, 2014 at 08:59 and is filed under GENERAL STUFF, MY WRITING, Uncategorized. You can follow any responses to this entry through the RSS 2.0 feed. You can leave a response, or trackback from your own site. Mike, I am really so sorry for Harry and I moved me about his story. Very lovely pictures of your pets!